Get more from business school. Whether you earn your MBA online or on campus, Regent will prepare you to own and operate a business. Our Master of Business Administration – Entrepreneurship program emphasizes the value of change, adaptability, research and planning to expand business—all from a Christian worldview. 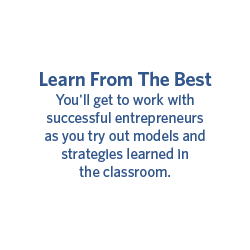 Learn to recognize opportunities, generate creative ideas and conduct feasibility analyses. Create an autonomous operation through effective principles of investment and financing. Get the expertise most entrepreneurs lack—46% of businesses fail due to incompetence and 30% from lack of managerial experience (Source: Indiana Small Business Development Center). Ranked in the Top 5 online MBA degree programs in Virginia, our MBA programs are accredited by the Accreditation Council for Business Schools & Programs (ACBSP). Develop operations plans and determine appropriate quality improvement strategies for product manufacturing and service delivery. Design marketing strategies specific to consumer and market needs nationally and globally. Develop sustainable business models for profit and the good of the community. Achieve results from your organization while leading others with passion and integrity. A comprehensive understanding of quality concepts and perspectives, designing and implementing quality, and continuous improvement of the quality system in different functional areas of the firm. Strategies and approaches to prepare small business leaders and their organizations to market, capture, bid, and execute contracts with federal, state, and local government agencies. The most efficient and effective way to fund a new venture or expand an existing enterprise including the best sources of funds to use (venture capitalists, bank loans, investors, angels, family funding) and the specific relationship one has to cultivate with each entity depending upon the wants/needs of each in the funding transaction. Dynamic alignment of a firm’s activities with the changing global environment in order to achieve one’s firm’s multiple goals. Current and prospective franchisees, franchise industry employees and service providers, and franchisors will learn how to assess an industry’s potential for franchising, how to identify and implement the key success drivers in a franchise business model, and how to choose a franchise that best fits your purpose, personality, and passion. Regent University weaves three innovative threads throughout our MBA program, setting it apart from other MBA degrees. Christ-centered, blending biblical principles and scriptural examples with modern-day business practices. Globally based, as students from around the world are led by an international faculty that integrate rich cultural insight and global perspectives to develop globally competent leaders. Entrepreneur-focused, integrating entrepreneurial and creative skill sets in every course and examining a holistic business model while employing creative strategies to address organizational challenges. Regent's MBA is highly customizable. Choose from traditional elective concentrations or develop an individualized plan to meet specific career objectives. Course projects can be applied to professional work situations. Advance a project at work by using the course to conduct market research or construct a specific plan of action. The coursework is relevant to different stages in a student's life. Build career paths and advance within organizations or cultivate new skill sets to advance in key leadership and management opportunities. Blend on-campus and online courses for the best of both worlds. Business travel will not interrupt the on-campus student, as course assignments can continue online. Online students are always welcome in the classroom when they visit Virginia Beach. Projects in each course allow students to create portfolio-quality material. Regent MBA students can demonstrate their knowledge and experience in a job interview by sharing the professional plans they have developed in the classroom. Regent's MBA program is accredited by the Accreditation Council for Business Schools and Programs (ACBSP). Another accrediting agency for business programs is the Association to Advance Collegiate Schools of Business International (AACSB). Both accreditations indicate top-quality academic programs, but there are a few differences in qualifying criteria. Accredits business education programs at all levels of higher education, from associate to doctoral-level degree programs. Recognizes excellence in teaching, considers tangible learning outcomes and requires continuous quality improvement, ensuring the business program provides students with the knowledge and skills most sought after by employers. Known as a leader among accrediting agencies with regard to learning outcomes. Specializes in accrediting business and accounting programs from the bachelor's to the doctoral level. Considers continual quality improvement and requires faculty members to produce focused research that advances business theory while maintaining their teaching responsibilities. Accredits programs primarily located within larger schools whose emphasis is on faculty research and publications. Regent's MBA program uses an 8-week course schedule. For each 8-week course, students should set aside 12-15 hours per week to commit to their coursework. Full-time students take two courses every 8-week session to complete the program in 16 months. Part-time students take one course every 8-week session.